I'm sorry, but here is Barbara Bush standing with some people all done up in their Episcopal finery. She's standing next to the Archbishop of Canterbury. That's funny, isn't it? "The Archbishop of Canterbury." This photo was occasioned by the installation of a rector, a new preacher, at an Episcopal church in Houston, Texas. That's funny, isn't it? "Installation of a rector." That's a funny statement to me, "installation of a rector." The photo was taken at St. Martin's Episcopal Church in Houston, Texas. Seven-thousand members. The largest Episcopal church in the U.S. And that's the ex-prez on the other side of the Archbishop. And you can't see him in this cropping but there's a guy standing on the end who was once The Bishop of Texas. "The Bishop of Texas." That's funny to me. And here's what Babs said while standing among the Katrina refugees in the Houston Astrodome: "What I'm hearing, which is sort of scary, is they all want to stay in Texas. Everyone is so overwhelmed by the hospitality. And so many of the people in the arena here, you know, were underprivileged anyway, so this is working very well for them." I use the photo above—lifted from my alumni journal—elsewhere in this issue. With humorous intent. But it's kind of funny here too, isn't it? And isn't it kind of decadent? All the Episcopal finery? And the smiling? Once again, the wealthy, all dressed up. Smiling. We're taking a week off and will return on 9 May 2008. Even though I claim to be a recluse I do think about going away. Usually at this time of year; I don't know why. I get all vibrational. My walks and sitting on the wall out front a few times a day don't work to calm me. Not even my glass of cheap red wine. And I begin to think about going away. So I checked the bus schedules and went online to some Vegas hotel websites and I can't afford it. My fault—something about some fountain pen excesses. Yes, fountain pens, and I just don't have the money, even for a bus and staying at the Four Queens or El Cortez downtown. So I said what the hell, Cathy just wants me out of the apartment, and I just want a few glasses of vodka to ease these seasonal vibrations. I'll look around locally, see what I can find in Santa Monica. Cathy can give me a ride down there; I’ll get a little ocean-view something and stay the night. So I went online to the Shutters On-The-Beach website; it’s a hotel in Santa Monica. Yes. And a small room for one night is $475.00. Four-hundred and seventy-five dollars. So I won't be going there. So I dropped by Cheers, my local liquor store, and asked about their vodkas—it’s down the alley from our apartment. I like Hangar One and Chopin. They didn't have Hangar One, but Chopin was available. And I might just buy a bottle tonight and sit quietly and sip. In my LA-Z Boy. I think I will; see how it works out. Cathy has a nice bottle of Scotch that we bought recently, Johnny Walker Black. Maybe we'll sit and have a sip or three and see if I behave; see if I can handle it. Listen to our great classical station, KUSC. One or two glasses. Chopin costs $35 or so a bottle, and I think we have some ice. If not, I'll buy a bag for a buck or so. Yes, so even with the ice and tax, that’s what? $39. And Shutters On-The-Beach wanted to charge me $475 just for the room. So if I stay home, go down the alley and get my vodka, I'll save $436.00. See how it works on my seasonal vibrations. But I won't make it a habit. I've tried that before, and it didn't work out. Our first issue was published on 7 April 2006. This anniversay issue is a retrospective. Most of the pieces we've chosen haven't been seen recently, while one is a revision completed only today, just then. In honor of our second anniversary, we've also revised the Contents Page—added categories, dusted. Maintenance that had become necessary because of all the content we've collected in two years; please have a look. Thanks for reading. I sat dutifully in the dark during the recent Earth Hour. Lights out for an hour; Cathy and I talked. Or at least I talked—about how there are too many goddamn babies and how it's that surfeit of babies that causes environmental problems and how these Kumbaya moments distract from the real issue. Babies become people, you know. Say, didja ever notice the woman in the checkout line proudly presenting her cloth eco-bags and refusing those nasty paper things for her groceries? Didja ever notice how many children were asking for her attention? Under her feet? Under your feet? Climbing on the register? Say, didja ever wonder about fertility docs? I guess it's OK to use their services if you live in an upscale area where it is a well known fact that beautiful and productive and non-criminal children are produced. Sure happy that disease and lousy medical care still take out so many poor babies. Say, can poor people afford all that neonatal stuff? Sure hope not. I've been getting in touch with my body. Part Two. When I was young and an actor...OK, when I was a young actor...I played Grandma in Edward Albee's "The American Dream" in a small but great theater in L.A. Yes, Grandma. Grandma had many great lines, but here's my favorite: "Most people think that when you get old, you either freeze to death, or you burn up. But you don't. When you get so old, all that happens is that people talk to you that way." I don't know why I mention that. I have four doctors. My grandfather was a doctor in Gadsden, Alabama during the days when a person only needed one doctor; my grandfather was a physician and surgeon. But I have four doctors. Two of my doctors are named Jeffrey. One is named Richard and the other is name Alaa. I saw one of the Jeffreys—my dermatologist—on Tuesday and he told me that the redness on my hands was caused by eczema and was not a result of a rotting soul. I thought that my hands were rotting because of evil thoughts—Deepak, Oprah, Dr. Phil. No, he said, eczema. He also said that I should moisturize twice a day and not use soap and water to clean my hands. So for now I am clearing up the soul-rot, I mean, eczema, with a cortisone cream called betamethasone; and then, after the manifestation of evil thoughts, I mean, eczema has abated I will moisturize twice a day. Twice a day, he said. I wonder what my grandfather would have prescribed. He wasn't a church-goer. I've been getting in touch with my body. You've heard it: "Get in touch with your body!" Usually someone is selling something. Deepak is selling something. Dr. Phil, Oprah. The snake-oilers. Well, being a certain age and just sitting around will provide the same result. "What in the hell is that? Jesus Christ! I'd better take care of that sumbitch." I have; and I'm fine. But as Samuel Johnson said about an imminent hanging, being in a hospital, even for a short stay, does concentrate the mind wonderfully. This issue is dedicated to Dutton's Brentwood Bookstore. It's closing on 30 April 2008. I write about it in "Alex At The Door," in this issue. I need a bit of cheer. That's Jimmie, a loving cat who doesn't get enough ink here. It's Alex-this and Alex-that. Jimmie is also a tabby who was adopted from Pet Orphans; he's been with us for ten years. We just took him to the vet for a geriatric check-up, and he's fine. When I put my bones in my La-Z Boy he will frequently join me. He's greatly loved. And, speaking of great love, your local Independent bookstore needs your support. You'll weep if they close; I can't stop thinking about Dutton's. We're taking next week off and returning on 14 March. I just bought a little CD plus radio thing for my office. Think I'll listen to some music for a while. Curl up with a cat and listen to KUSC, L.A.'s great classical music station. Just as Dutton's Brentwood is L.A.'s great bookstore. 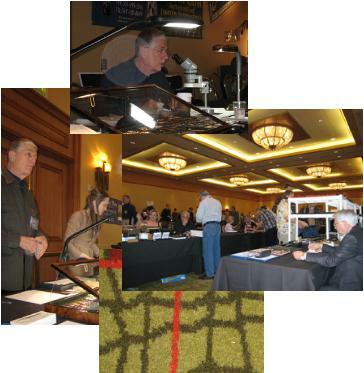 What you see above is a collage of images from the 2008 Los Angeles International Pen Show. It's a collage because not one of the photos I took on the 16th and 17th of February at the Marriott in Manhattan Beach was worth displaying by itself. Nevertheless, there is some information here. 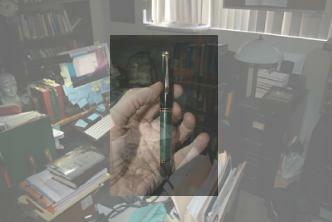 The gentleman pictured twice is John Mottishaw of Classic Fountain Pens. The young woman is Sarah, one of his associates. (I'd like to show you a clear photo of Jonathan, another associate at the show, but all of his photos were out of focus.) There's also a larger image of the show room and a photograph of the carpet, which I took as I was hurrying to take a photograph of the naked...OK, OK, I just engaged the shutter by mistake as the camera was pointed toward the floor. Of course. Next year I plan to take a room in the hotel so that I can have more conversations and spend more money on fountain pens—even though I am not a collector. I enjoyed myself, OK, immensely. Could be something about the good people who gather at these shows. I'll learn more about my little digital camera by next year so that I can take their photos, in focus and all, no carpet. There are other photographs in this issue and they are by Catherine Roberts Leach, who knows what she is doing with a camera. Obviously. I walked into my office the other day and saw a configuration that reminded me of formality and old school, weightiness, and, you know, tether. I saw a lamp that I had bought because of an ad in the New Yorker and just because of that one lamp I said I could do really do something with this room. I think that a large mahogany desk with maybe a heavy leather chair and, oh, yes, maybe a different lamp for the desk, one of those green library things, brass and green. So two lamps, one here and one there. Big stand for one of my dictionaries. Heavy. I also enjoyed the thought of a new Mac for my big old desk. I’m kinda sorta looking forward to the day when this dear thing dies so I can buy a new iMac something with an aluminum front and faster and a faster bright screen, bright screen. Imposing and shiny, smart. Oh, and last Sunday I took five hours and installed the new Mac operating system, Leopard. Yes, Leopard. So much faster sexier smarter than the old system. And something else, I recently changed my DSL carrier. So much faster sexier smarter. Now with AT&T. So much faster and I need faster you know when I upload my page each week. I appreciate those extra three minutes that I save with the faster upload. I really do. Faster DSL, like a quickening of mind. And did I mention? I think that I must have five word processing programs, the latest is pretty good, too, Nisus Pro, has a dictionary/thesaurus in a little tool drawer that slides out to the side of the main screen where you write, catches misspellings. Very helpful for the writing process. But I also have WriteRoom and Papyrus and dread Word and something else, yes, Ulysses. All of them are so very helpful for the writing process as I try to touch soul stuff. Then there are my fountain pens. I didn’t really cover this in what I wrote about pens in this issue. I didn’t say that a fountain pen is a technology, yes, a fountain pen is a technology external to the stuff, and the stuff is spirit. And no technology can facilitate the expression of that stuff. But with a pen...it’s so...it seems...it's that something flows out wet to the page, like blood, like something from inside the mind, you think it's smart soul stuff glistening there on the page. Even when it’s not. You should read my beautiful journal or not for a take on what I write with one of my beautiful pens in my beautiful journal. Leather ribbed spine, heavy paper, Italy, $55 each for my paper journals, 350 pages. Quite necessary for the recording of soul stuff, don't you know. Little spiral pocket notebook wouldn’t do. I also have a stack (a stack) of Moleskine Journals that I can’t use—the paper’s too thin for a fountain pen, ink bleeds through and feathers. Why did I buy a supply? The Moleskine insert said that all the famous writers had used Moleskines to record their brilliance—Camus, Hemingway, God. I have to use Mr. Kundera’s phrase here. The Unbearable Lightness of Being. And I’m still working on this, but I seem to remember that Milan Kundera took the line from Karl Marx. I can’t verify that—haven’t yet been able to verify that—but wouldn’t that be interesting? Materialism and all. The source doesn't matter; I'm in the middle of it now, trying to figure the confusion between soul stuff—so light, so light—and the spurious tether of the material. I think that many of us are. We always work to publish on Friday and here it is Saturday. What happened? It was the technical matter of changing our DSL provider; and, yes, we signed on with dread AT&T and, even worse, Yahoo. We had been with DSL Extreme, but those boys kept on failing, talking about the "interface with the telco." And it happened three times in six months. Once the outage was for thirty-six hours. But they were the little guy and we should support them we said. But the little guy actually is a reseller and rents the lines from, yes, AT&T. So, what the hey. Gotta have reliable service and having checked with a few friends who have AT&T/Yahoo we made the change. Besides, when the little guy had the thirty-six hour outage, they offered no explanation, made no apology, offered no refund. In other words, they behaved like the big guy. So here we are, running dog capitalist war mongers. Compromise. Some good people in Catherine's department at work put together several holiday boxes for a Marine unit in Iraq. The letter above was written by one of those Marines in appreciation; it is transcribed below. I don't think that a non-Marine is allowed to say, "Semper Fi" so I won't. But I have a friend, a dear man, a reader who served as a Marine. After reading this letter perhaps he will say "Semper Fi" for me, to honor these Marines. There was no time to obtain the corporal's permission to use his name, so it's been withheld. Greetings from Iraq! I apologize for taking so long to write you, but as my mother may have told you, my communication with the real world is sparse. First of all, I would like to thank you, along with every other person who contributed, for the enormous boxes of goodies. I know that myself and my fellow Marines were greatly appreciative. The most popular items for me had to be the Slim-Jims and candy. I know that some Marines went after the sponges & lotions. The males tended to get funny looks for that. The holiday season is especially difficult to deal with while deployed. The generosity of yourself & others greatly offset the loneliness and homesick feelings. We aren’t robots, so we all miss home. It is nice to know that people back home care about us. I know that I, personally, am quite humbled by the degree of outreach our citizens offer. I believe that men, like myself, can see that they are not alone in this ordeal. We are carried forward by the collective strength of our families, loved ones, friends and strangers. Your contributions make more of a difference than you may ever know. We don’t always use everything sent to us. We can’t eat every piece of candy that comes our way. What we do, instead, is drop unused food & toiletries down to the Iraqi people. We scatter candy, by helicopter, over school grounds. These people have very little, so we never throw anything out. We give our excesses to the poor. In this way, your contributions help shape a better world. Tell everyone thank you, and tell my mom that I love her. God bless. This issue is dedicated to Catherine Roberts Leach; you'll find some of her current work on the cover. Recently, Catherine was invited to become an artist member of the Los Angeles Art Association (LAAA), an 83-year-old non-profit professional art association with renowned artist alumni and two exhibition venues in Southern California. Catherine is my wife; I am so proud. And the work above was one of the works shown to the LAAA in applying for membership. See the drab sign with its sad trumpet vine? You might say that a vine can't be sad because it is a vine—that's anthropomorphic and silly you might say. But for years, since I had the vine planted while managing this building, I have wondered why it has not blossomed. Why it looked so sad. The gardener promised me that it would bloom and frame nicely the mangagement company sign, or better, cover the management company sign, yes, indeed. But now we have a new management company and a wonderful new on-site manager (a talented gardener!) and just the other day I noticed, at the top of the beautiful old tree in front, the trumpet vine and it was flowering, trumpeting, reaching for the sun—no longer, I insist, sad. And you say there's no magic, no valet parking? Just look. I know; I know. But, you see, this beautiful limited edition (L.E.) pen from Classic Fountain Pens is, er, of limited availability. So I had to buy it now even though my, er, my, ahem, yes, birthday—a significant, divisible by ten, birthday—isn't coming up until July. See, I'm buying it from the man, John Mottishaw, who has so beautifully modfied the nibs of the pens that I write with—fountain pens—every day. In my paper journal. And he's also modifying this nib. And...did I mention a very important birthday? And yes, yes, I know that I wrote a long piece about want and need and such and asceticism. But in that piece I forgot to mention the wondrous joining of utility and aesthetics that is a fountain pen. And I didn't do any sneaking around in buying it either. Cathy knows and even contributed because it's my birthday, divisible by ten. I needed to tell you all this because of that piece I wrote. You understand, don't you? My copy editor suggested that we needed some extra time off over the holidays and that our standard four weeks per year of vacation were not sufficient. "We work like dogs," he said. And then he said that he didn't like the idea of working like a dog. So we took the holidays off. But I haven't made a final decision on yearly vacation time. And that's because I like doing this page. So we'll see. Glad to be back. Happy New Year!